William Kloefkorn was a Nebraska poet and educator from Lincoln Nebraska. He was the author of twelve collections of poetry, two short story collections, a collection of children's Christmas stories, and four memoirs. 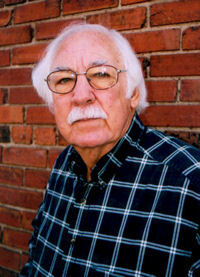 Additionally, Kloefkorn was a professor of English at Nebraska Wesleyan University. Kloefkorn was born in Attica, Kansas, on August 12, 1932, and died on May 19, 2011. He received his BA and MA in English from from Emporia State University in Emporia, Kansas. He did additional graduate work at the University of Kansas and the University of Nebraska-Lincoln. Prior to teaching at Nebraska Wesleyan, he taught at Wichita State University and at Ellinwood High School in Ellinwood, Kansas. William Kloefkorn died in May of 2011. When it began, Nebraska's state poet told himself he would not write about his illness. The risk of being maudlin was too great. But he did, and Bill Kloefkorn decided some of the poems weren't too bad. Like the one he called "Hands." Kloefkorn -- husband, father, grandfather, great-grandfather, professor, poet, friend, mentor, hog caller and expert carver of walking sticks, died early Thursday. The Kansas native who wrote of his boyhood in Attica and retired from full-time teaching at Nebraska Wesleyan University in 1997 had suffered an immune system disorder that left him progressively weak the past two years. "He loved people. He had a million friends," said fellow poet Twyla Hansen. "This is a horrible loss for Nebraska and for poetry." Kloefkorn's 31st book -- "Swallowing the Soap: New and Selected Poems" -- was published this winter. And in fall 2012, a Lincoln elementary school will open, named for the man who spent years working with young students as part of a national program called "Poets in the Schools." "He was a great poet, but he might have been an even better teacher," said longtime friend John Walker. On Tuesday, Walker and another close friend, Jim Pipher, went to visit the state poet at his home. They'd been stopping by every few weeks to play music, swap stories and jokes. "I put him to work," Walker said. "I brought him a poem to critique ... which he did in his indomitable fashion." The poet's mind was as sharp as ever, Walker said. But his body was giving out. "I told Twyla I thought that would be the last time I'd see him, at least on this earth." The word of the poet's passing spread Thursday via email and phone calls and Facebook. His family gathered at the home he shared with Eloise, his wife of 58 years and the subject of many of his poems. At mid-afternoon, final arrangements still were being made. Pipher spoke at the request of the Kloefkorn family. "He influenced, it has to be, thousands of people," Pipher said. Kloefkorn was always willing to mentor, but never in a critical or patronizing fashion, he said. "He said something and, by golly, you felt better. That's what I will carry the most -- the way he was kind." And beyond the thousands who read his words or sought his advice was the love he had for his family. The Kloefkorns have four children -- Terry, Tracy, Rob and John, along with 11 grandchildren and two great-grandchildren. Four years ago, in honor of his 25-year tenure as state poet, Wesleyan honored the white-headed baritone with a poetry reading called "Kloefkornucopia!" at which poets inspired by his teaching read poems in his honor. Kloefkorn also read. Two of his favorites: "Moving on," penned after the death of a former student's daughter; and "My Love for All Things Warm and Breathing," a poem featured on Garrison Keillor's "The Writer's Almanac." I have seldom loved more than one thing at a time, yet this morning I feel myself expanding, each part of me soft and glandular, and under my skin is room enough now for the loving of many things, and all of them at once. Unpublished interview of Kloefkorn by Tom Prasch, done in 1980 for the Lincoln Voice, a short-lived magazine in Lincoln, NE.